We all know November is often seen as a very important month in the finance world. Why? Well, probably not because it is the month I was born (other than to me); more importantly in the finance world, it is when the best period for the markets begins. The stretch runs from November to April with the 1st half of those usually the stronger segment. The seasonality we see there has been going on for a long long time, but as with any type of seasonality, it is not infallible and often gets trotted out to prove a narrative versus just being used as one data point to factor in. This year alone we have seen many holiday seasonality norms turned on their heads like happened Thanksgiving week, only to rebound shortly after while many sit disappointed and miss the opportunity. This is not mentioned to shame anyone, but instead to point out how hard this market actually has been this year. So if you are having a tough time, keep at it and work your opportunities the best you can and keep an open mind. November in the markets didn’t disappoint this year as the month started off weak in continuation of October. Shored up the breadth picture during the middle of the month, and then ended with a strong move off the lows. It was not just a very volatile month, but it also felt important in a few ways we will discuss below. I apologize for the length of the post, but I am going mix both the top down view along with some breadth figures to add to the argument. I will also try to address both the bullish and some bearish arguments based on what I am seeing in these charts So, lets jump right in and start with a top down view of the markets. Starting with a long term Monthly chart going back to 2008 before the large trend started zooms out enough to put the latest run and correction in context. 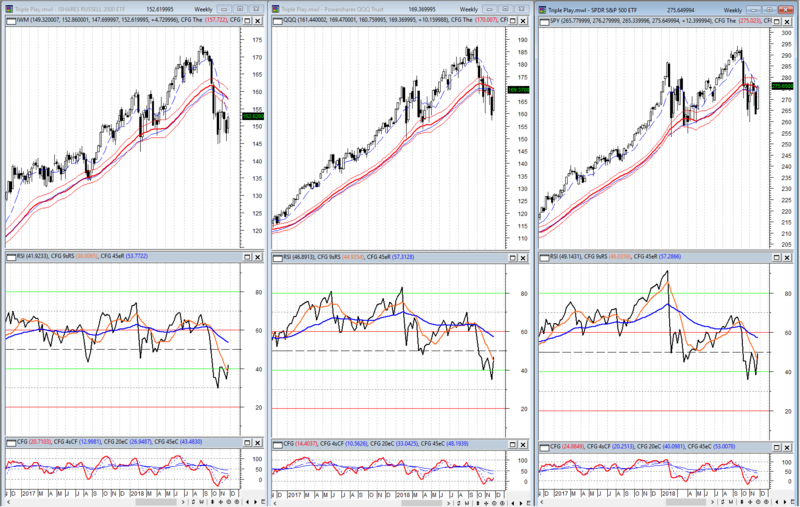 So far it has been a sharp drop registering with some of the larger ones we see on the chart, but overall it still sits in a strong RSI bull range and above rising MA bands with the longer term uptrend shaken, but intact. RSI had gotten elevated as priced extended further from the MA bands which came to an abrupt end in October and early November. The swiftness and severity was in some measures hitting extremes rarely seen, while others didn’t even get stretched or tested. Yet during this the sentiment certainly got tested with heavy rhetoric on both sides. Zooming in a bit on the Monthly we can see the tails are present with this months Doji or harami suggest the selling pressure is waning, but no confirmed reversal showing yet. One really rough month (and maybe a half) could be it for now if buyers can continue to push back in. I mentioned early October I was expecting a short and sharp correction this time since the one early 2018 became drawn out for months. While I was wrong on when it would begin (not helpful), we might be seeing that play out here still. At the depths, in mid November during the retest with the fear palpable, this scenario also got tested, but remained a viable scenario. Now we are seeing long tails, potential candle reversal patterns and RSI positive reversals set up after working off overbought readings quickly. A confirmation candle is needed for the reversal candles, but the stage is set. Longer term charts should carry more weight and should be respected until disproved or negated. This market could certainly go either way still (and likely could test those tails a bit more sometime in December) which is why we should be on guard for a failure. However, if this were a daily chart with the same look, I would be seriously considering as a reversal candidate. It’s not a daily candle, and I don’t want to wait a month before making any more decisions, so lets keep working down a level at a time. The weekly view shows a little more detail in the battle going on. 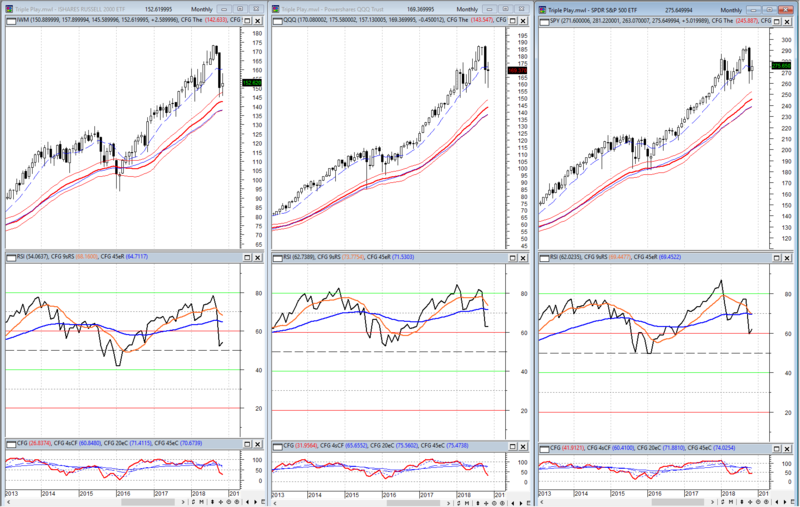 Above we see all three had moved below the MA Bands while RSI lost 40 and moved out of the bull ranges; both are bigger negatives for the intermediate time frame. Since going under those a over 6 weeks price found a low and got rejected by the MA bands on the first trip back to test the underside of them. After that rejection, we then held the lows (for the most part) while RSI and CFG momentum indicators have began to improve. $QQQ made a lower low, but recovered that quickly this week. $SPY put in a tight RSI positive divergence right near the 40 level as we closed the week. 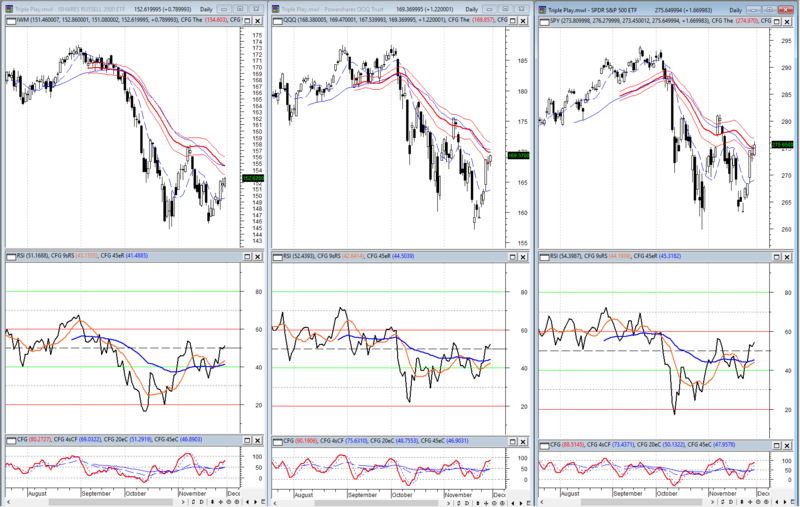 Again a mixed picture; the momentum indicators are in a spot we could expect more improvement from here, but until we get back above the MA bands and then over 60 on RSI these moves higher are still suspect. We closed the week in the MA bands which are close to the top of the small ranges we formed as the markets retested the lows. Below we look at the 1st breadth chart showing the New High, New Low Differential provided some support to the successful retest idea. These breadth chars are shown on daily data using $VTI Vanguard total market index as the price component. It shows the stronger increase in new lows and drop in the differential into the October move lower, but as we moved back down to restest in November those new low numbers we substantially reduced. 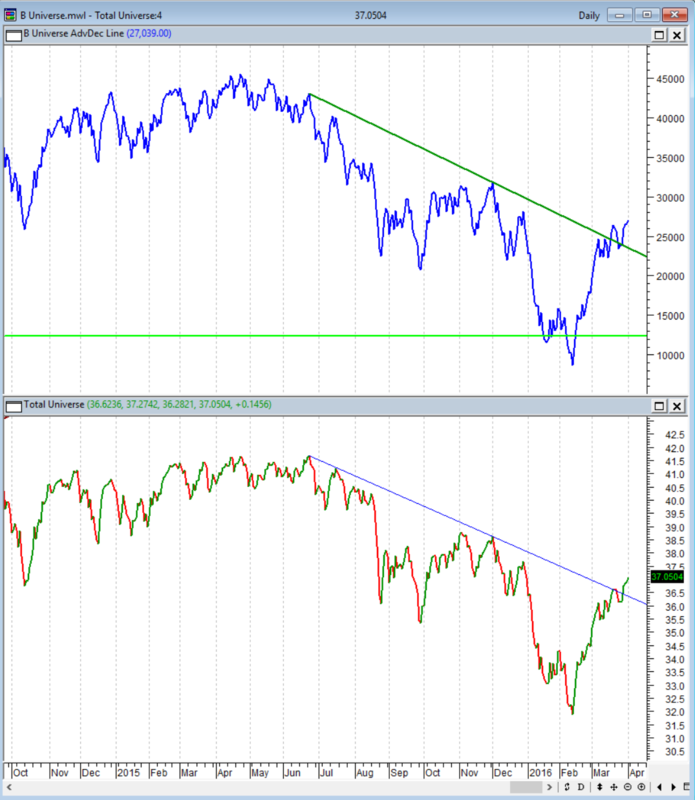 Even if not an official divergence, this large reduction is a net positive for the market internals at a tough time. 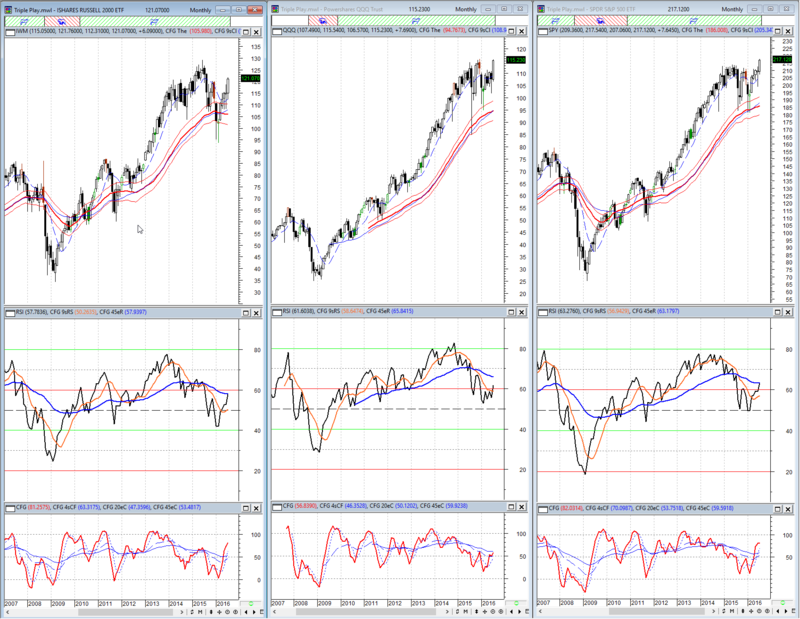 I do need to note that this charts is still showing 2 of 3 sell signals as the moving averages remain below zero, but are moving up some after the recent strength. The NHNL itself turned positive late week, but still not strong positive readings, which is similar to other longer term breadth readings which are just not reacting much yet. The MA Breadth chart also shows the lack of movement in longer term measures, but the shorter term started diverging into the original October lows and never even got close to those lows in November suggesting participation was ready to start improving and help support the reversals. Back to the Daily TP Chart below we can see that bounce started slow and then kicked in Wednesday with an 80% up day as price put in a very strong candle. Even better, the next day we didn’t see it all and more given back. Most recent rally attempts have been met quickly with heavy sellers which didn’t happen at the end of the week. A notable change in character. From an RSI perspective though, the daily view is in a RSI bear range and below the MA bands and hasn’t made a higher high, so other than the positive divergences, this level is still somewhat questionable and needs to be on watch for how it digests the recent move. Soon we should see it either consolidate these gains or see an resurgence in sellers that cause another failed move which is exactly what market bears feel we are set up for sooner than later. Now on the bullish side, some are also already calling for double bottoms, but we won’t know that until we see how a test of the middle peak goes, which is also likely to be near where RSI will reach the 60 level. Over it and we get a higher high, confirmed double bottoms and RSI bull range shifts. I see that resistance as a big key to how the end of the year shakes out, but we may also have to deal with a some earlier resistance here at the MA bands. With the price action improving, but not over the hump yet on the daily time frame, we look back to the breadth side with the McClellan chart. As most of you know, McClellan Summation is one of my favorite intermediate breadth indicators and when coupled with Oscillator divergences at extremes, it can be very hard to beat. Well, that combination came during the 1st lows in October. It was one of the big reasons we stuck with the retest idea in November and didn’t get too far into the falling off a cliff mantra that was going around. You can’t ever know if a signal is going to work or fail, but Oscillator divergences from extremes don’t come along that often and when the Summation is below zero their efficacy goes up. It also helped that the Summation Index barely budged on the November trip back toward the lows. Under the surface strength showing up in the breadth numbers here adding some support to the intermediate term view as the daily charts try to shore up. Our final chart drops down to the 65 minute time frame which is the lowest on the totem pole, but also has turned decidedly bullish over the last week. 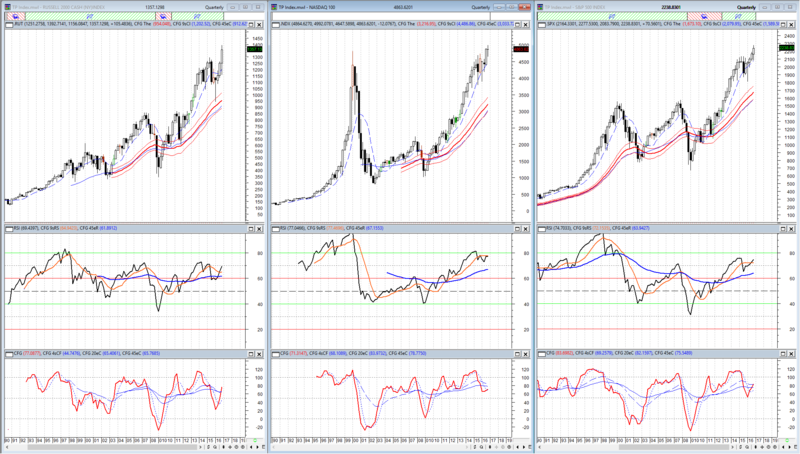 This chart cleared the MA bands, turned them up and shifted to RSI bull ranges during this week. We are even seeing price holding up well as the RSI & CFG indicators work off their overbought readings and fire new RSI Positive Reversals exemplifying strong price momentum that is not waning here yet. This is the first time frame we watch for character change in the markets and we did see that over the last week, now let’s see if it has enough staying power to move up and help shift the daily, then weekly, then possibly monthly charts back into their own RSI bull ranges. It is pretty easy to make an argument here for both the markets to continue higher and eventually retest the old highs from late Summer or for sellers to re-assert themselves into resistance, make another lower high and then push to new lows. After the October drop, there are many that are looking for the latter scenario, and we need to be ready in case we do start to see buyers fizzle out here soon, but don’t count them out just yet. If you like what you see, follow me on StockTwits or Twitter. Of course, Apple stock $AAPL gets plenty of coverage in the markets so usually it is well enough left alone, but looking through charts this weekend it struck me how well it held up during the recent waterfall, so I wanted to look closer. Let’s look at 6 charts, 3 daily and 3 weekly that paint a decent picture of opportunity in $AAPL here if the markets can expand on this bounce. There is even a chance for a new breakout if it gets enough momentum off these lows. As with any trade plan you need to accept the risk plan before you start and structure things accordingly, which also sits pretty well here just a under 5% below current levels if generous, and a few spots to go even tighter. Starting with the weekly charts we can see that the up trend line off the April lows while steep did hold on 1st approach this week. The bounce off the lows was enough to just keep the close in the upper STDev channel which is your sweet spot. 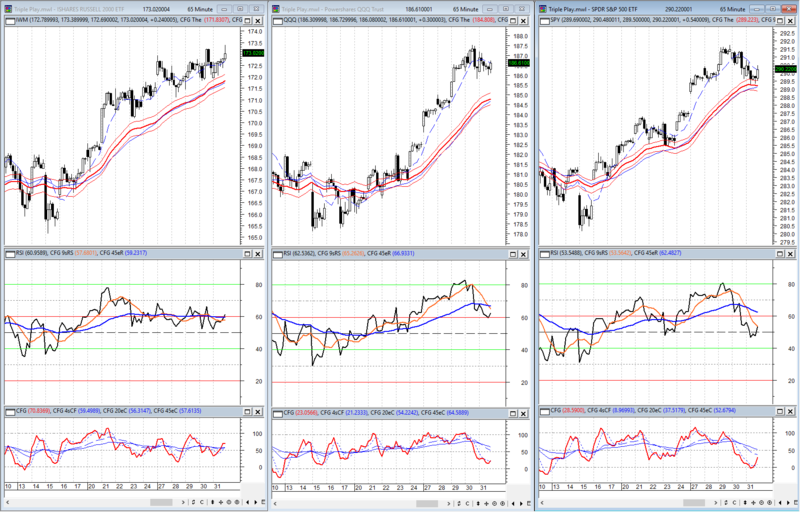 It is a little shaky though when it penetrates that much intra-week, but lets see where it goes. Overall the Bollinger bands are still rising and even potentially expanding, so it doesn’t look there was much price damage in the name by the end of the week. We did see a good amount of volume this week showing the battle that took place. On the next chart you can see that volume surge better and fall in the weekly OBV, but that indicator is still holding above the May breakout zone. While we are on volume, you can see this action happened near the bottom the VaP zone signified by the red line across the chart which also happens to be the bottom of the congestion zone and where the 13ema (yellow) showed up this week. Apple ended closing not only above the 13ema, but made it all the way back above the 8ema both of which continue to rise as do most other moving averages on this chart. Looking here, it seems pretty clear if we lose around 214 on weekly close it opens up the Kirby (volume vacuum or pocket) down to 190 area and then 170ish after that, so we don’t want to start that potential for a cascade. It would be better to hold up here and not tempt things. 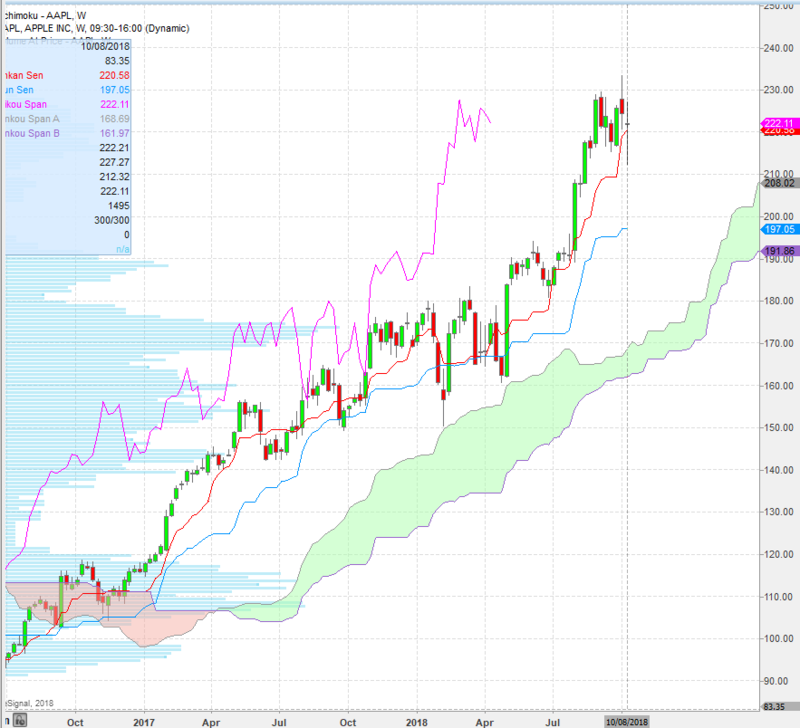 The final weekly chart is the Cloud chart which is also continuing to point higher and not narrowing for now, but note the cloud support here a good bit lower. It is not going to help all that much in the short term other than if the selloff continues and then we can look for longer support probably closer to that 190 areas unless it is an all out collapse, but not seeing signs of that here. Moving into the volume indicators on the daily view below you can see the OBV is bouncing off the September lows as price test the red line that marks the last big VaP bar before the vacuum starts that goes down to around 208 and then and even larger VaP vacuum (definite Kirby) to the largest bar around 190 which is all the way back at the 200sma roughly 15% lower. Along the way you have a gap near 210, which is why I thought that might be a decent close under stop for Intermediate to longer term trades in case this works. And if you are a faster trader you could use a close under in the 216.5 zone just under the line with a hard stop below Thursday’s lows to prevent any big damage. Again, it is not our goal to see the lows taken out since our trade plan is for it to hold here and move back higher, but there is an opportunity to flip into puts or short if we do start losing them. Ultimate goal if that were to happen would be the big gap down at 190 with the VaP bar right there to provide some support, but let’s not get ahead of ourselves here. One final piece of support is the daily cloud chart where price stopped right at the top of the cloud in Wednesday’s big candle, gapped down below it Thursday and put in a doji before reversing Friday with a gap back higher out of the cloud. 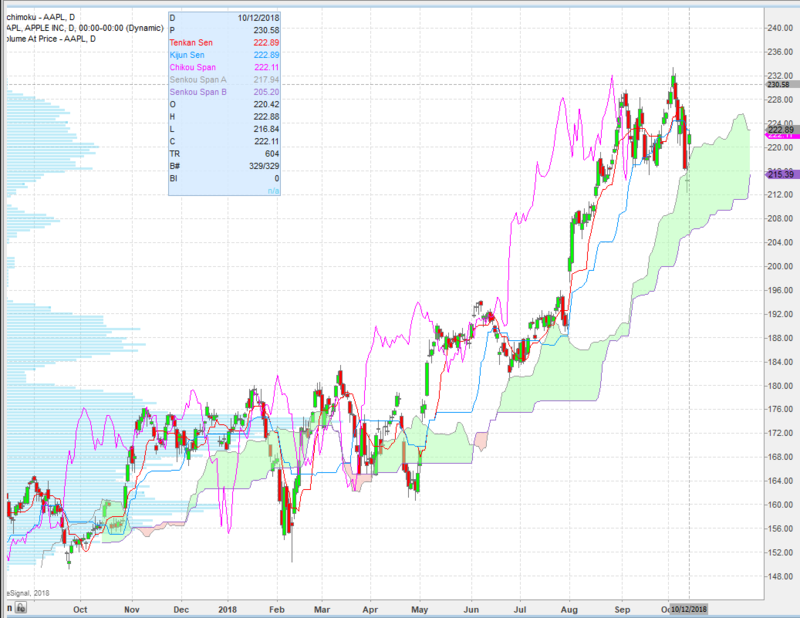 This looks like a strong exit from the cloud and favors continuation at least in the short term. Many like to look at the bottom of the cloud for support which is currently around 206 and rising under price pretty well. So if we hold up a few more days it could be used as a close under stop for those who are watching daily. I was prompted to look closer at $AAPL and other mega caps like $AMZN $FB $GOOGL and a few other from a conversation about leadership on social media. Which of all these start falling hard, it will definitely be a difficult weight to overcome, but not impossible. Currently, the others look good or bad on their own characteristics, but $AAPL caught my eye as a fairly tight technical setup with multiple good stop areas for various trading styles; and a pretty good list of positive price action in the last couple of days during the markets swoon. 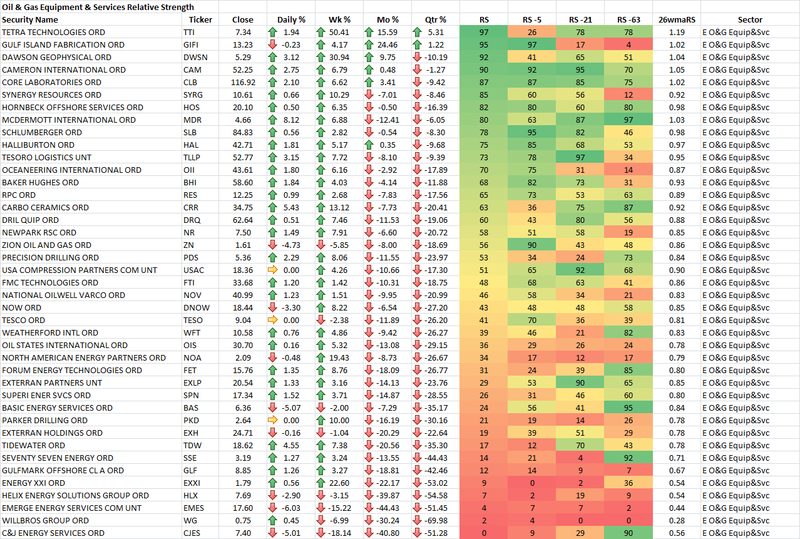 It is a name that is not particularly expensive when it comes to earnings metrics and Its options flow did get a couple of call sales in the last few days that put resistance above near 130 and 135, there is plenty of bullish notable call flow sitting from the last few months that can help fuel any breakout if the failed break down does propel this thing higher. 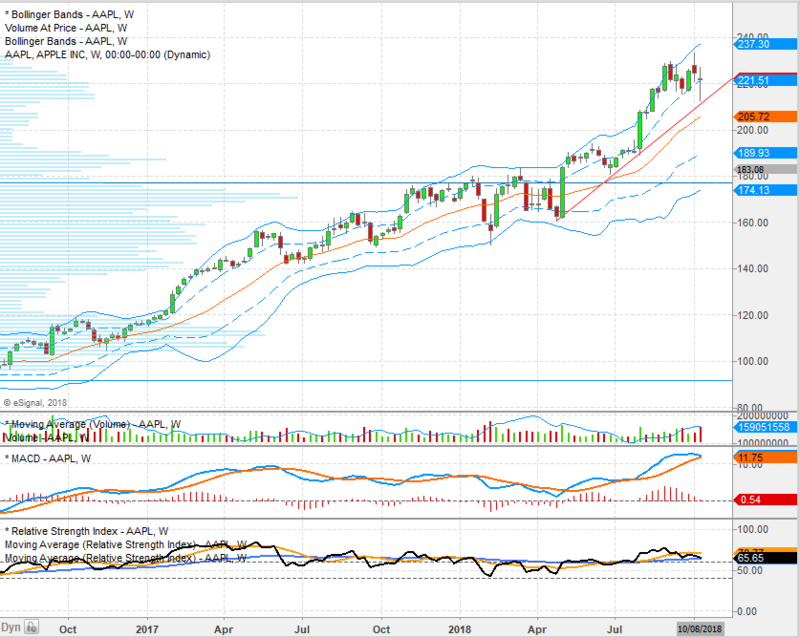 $AAPL may have paused over the last 6 weeks or so, but I have a hard time saying this one has lost its longer term trend or even leadership in tech over the this time period. However, if (very big IF right here) we start breaking these levels I am fine changing my mind and think it could (but doesn’t have to) weigh a good bit on the markets as a whole due to size, so a quick short or put play here could work well. Pretty easy to see I don’t find much time to blog these days, but I do like it when Month or quarter end come at the end of a week as well. It makes it easy to start at the top time frame and work our way down the charts to get an idea of where we currently are in the broad markets these follow both individually and in relation to one another. August ended Friday so we will start with the Monthly charts this time. The monthly trend remains strong after pausing the 1st half of 2018, but now looks to be on the march again. The RSIs are at or near 80 which should have us alert to changes and are likely to see more volatility up here, but they are not a sell sign in themselves. I did read someone talking this week about selling once RSI moved over 70, and I couldn’t disagree more, especially on a time frame as long as monthly. Indicators are for information and alerts price is better suited for actual signals. It is good to see how this charts is moving and keep it in perspective that things are getting elevated but also moving in a strong trend at the moment. 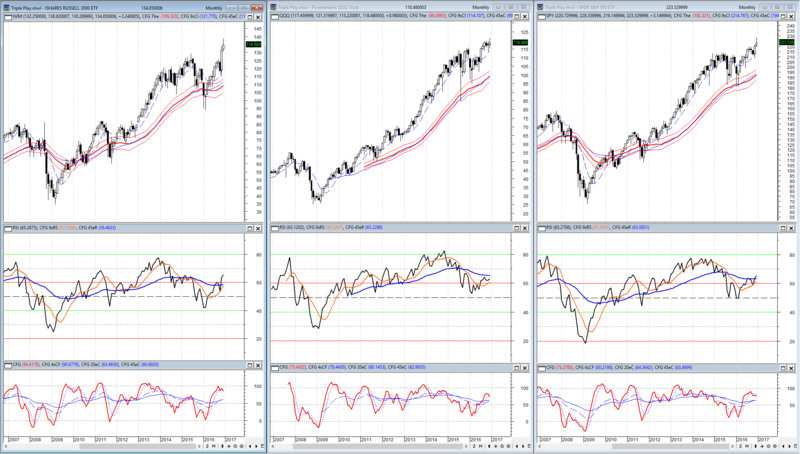 The weekly charts shows the strong trend on this level coming off the Winter pullback/volatility we saw. Coming down to this level you can see that the battle was fought and won by the bulls and we are in the midst of the extension that followed. Currently the RSIs are pointing higher but not particularly elevated. CFGs are nearing the 100 level which is where we start paying more attention, but they can move all the way to the 140-150 level if things get goofy, so 100 again isn’t particularly out there. 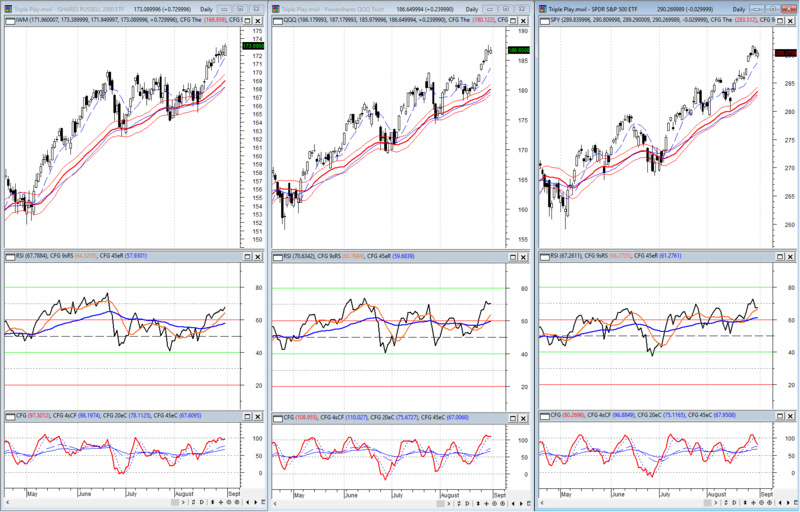 $IWM $QQQ are well above their January peaks, but $SPY is just know moving above its level. This has us on what for a failed breakout at this level which could usher in the seasonality everyone is talking about. Especially with August being strong, the next drum beat has to be a ugly September and October. I don’t think it has to happen as many do, so I am keeping my eyes open for an extension higher that keeps everyone off guard; but I do think it would be a decent scenario to see some weakness between Mid September and the elections to allow the markets some digestion time and maybe even a few backtests to strengthen the support zones below. 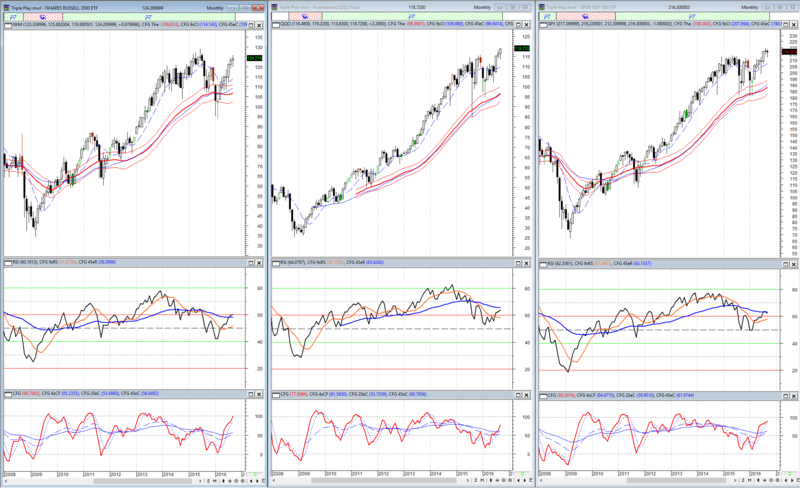 The Daily level looks set up more similar to the weekly charts. Nice pattern breaks recently and a new leg higher. $IWM was the most defined and worked great after finding higher lows at the MA bands 3 times it finally went out the upper rail. 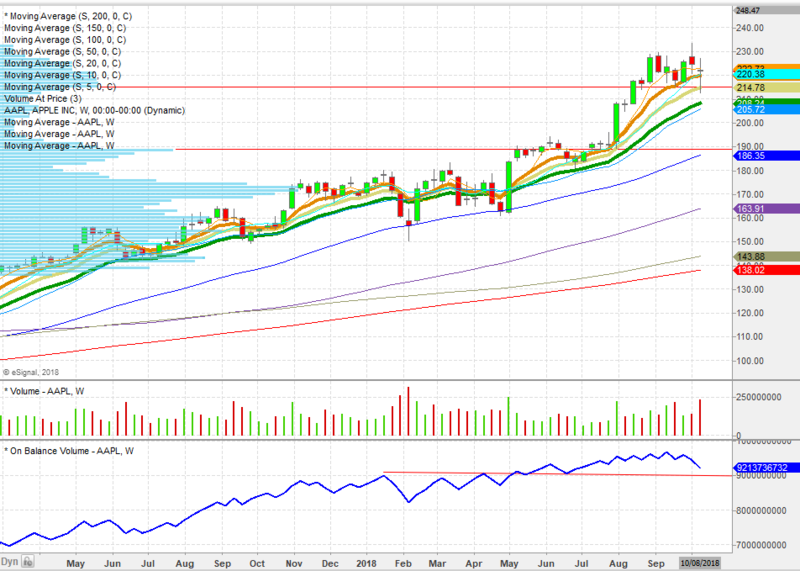 $IWM also finished the month on a strong note. $SPY $QQQ ended in small consolidations right at the highs. Nothing to get bearish about, but more digestion would be fine here as long as it stays contained. While not fearing seasonality, it can be used as a piece of evidence to help guide and potentially adjust things like position sizing and stop placement during a slow period. Again, we see the CFGs are at or above 100, but can stay up here a while or put in divergences before seeing a larger price top. Worth noting again, multiple divergences are not uncommon on the upside, so making sure you have some other confirmation is a good idea. 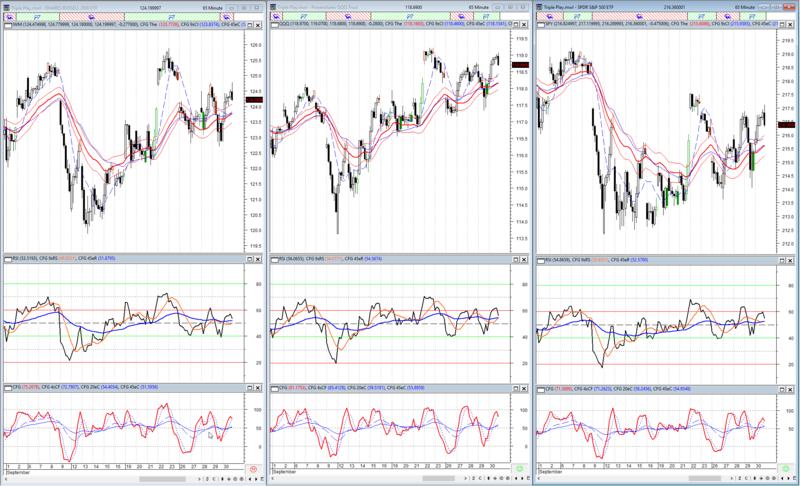 The 65 minute chart is the Intraday charts I use most and post when looking at market direction. If trading very short term, then 5, 15, 30 minute might be worth a look, but they don’t really add value in this kind of analysis very often. 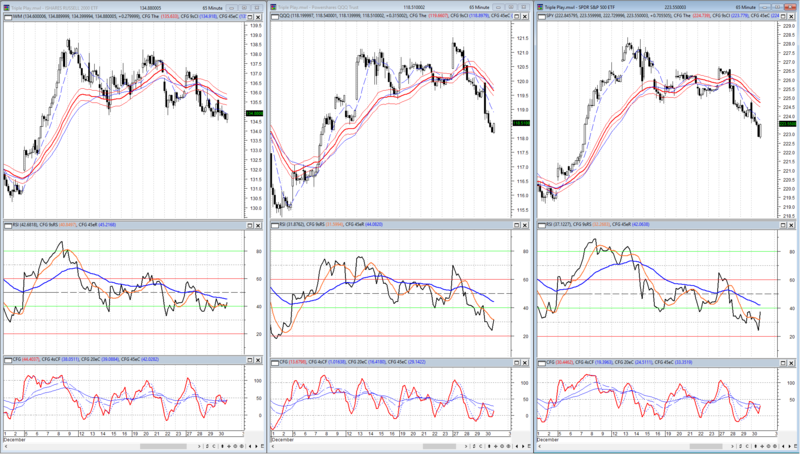 The current 65 min charts are all still in RSI bull ranges with mixed positioning to start the week. 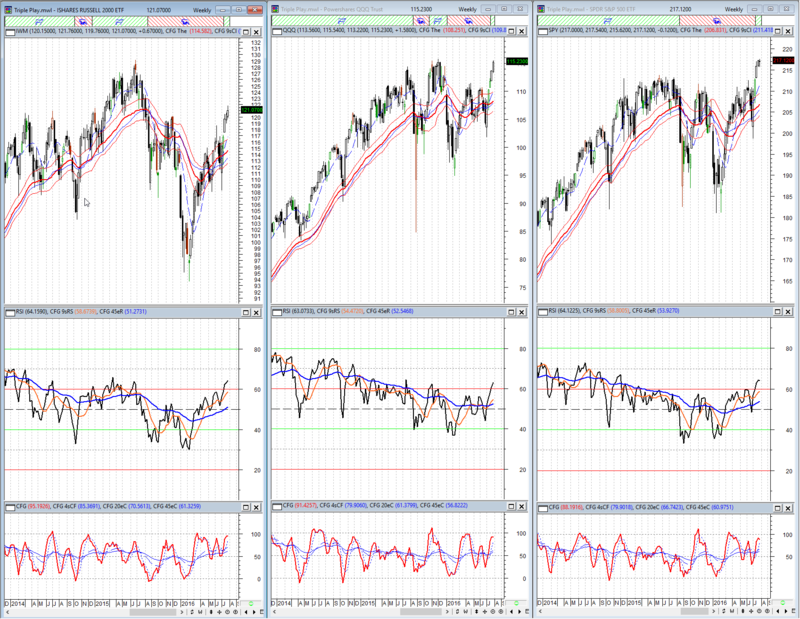 $SPY $QQQ are digesting the strong recent runs since mid August. 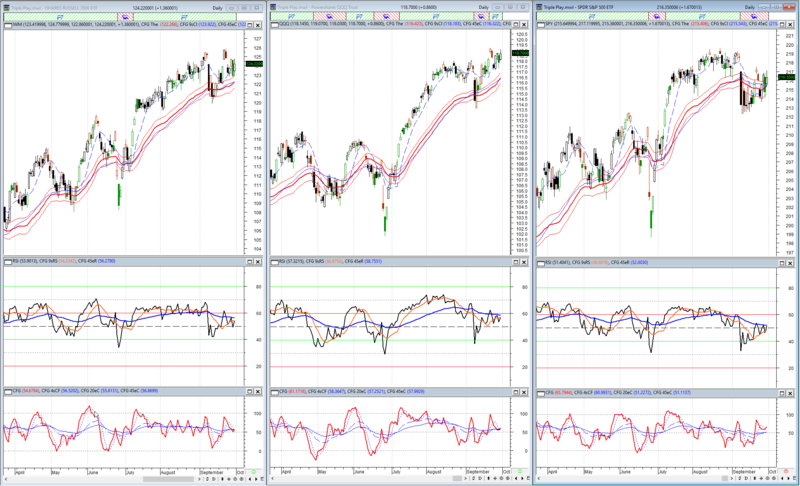 $IWM is moving too, but in a much more sloppy fashion. It broke out strong mid August, but has been a battle ever since. This was another place many were looking for a failed breakout the whole way and every time they felt like they might be getting a foothold, buyers showed back up and pushed $IWM back to highs. A quick look at it’s RSI shows the grinding nature of this move and also gives a good example of why we use RSI Range Rules instead of overbought/oversold signals. This is just a quick review of how I see the markets going into the current week. I also see strong breadth underlying these price charts which adds confidence to what we are seeing on the price charts. This could certainly take a turn at any time change my view along with it, but as we sit now, markets are a leg that started in later July or early August and could persist a while if these dynamics remain in place. Those who follow my Triple Play Charts regularly on Stocktwits and Twitter know this as one of the momentum based trend gauges we use to guide us through the markets. I post the same two charts every day which on one hand can get monotonous, but I feel the consistency keeps us updated on the ever changing view of the markets while also helping teach us the personality traits that can give clues in the future. I wanted to do an end of year review. In this exercise I take a look from the quarterly view using Index charts (since the ETFs don’t really go back far enough to use my indicators at this level) and methodically move down to the 65 minute chart that is part of the daily routine. Let’s get started. This level is for a 50000 foot view or a very long term investor. Don’t forget as we move down each time frame how much time each one devours to make a new candle. This quarterly chart is made up of the $RUT $NDX and $SPY since the $IWM $QQQ $SPY ETFs don’t have enough history to complete the charts. These cover the last 26 years of data give us a view of the long term uptrends we are seeing across all three at this point. This uptrends started in 2009, but do not signal the start of this bull market in my opinion. The recent consolidations on this chart I believe can serve as reset which means the new bull markets is less than 15 months old by most measures. The biggest detractor here is the $NDX ended the year with a d0ji with RSI elevated, but also firing a high level RSI Positive Reversal as this chart finally breaks above the 2000 highs. Even elevated, the RSI Positive reversal suggests the move might not be ready for a larger consolidation just yet. The $SPX chart also shows an RSI over 70, but a new longer term CFG Positive Reversal fired there as well in 2016. Finally, the $RUT is coming out of a long consolidation with a +20% drawdown or bear market and now has its own RSI (tighter) and CFG (longer term) Positive Reversals firing as it closed the year on a strong breakout. RSI are elevated but still acting pretty strong and all CFGs are turning up without making it down to Oversold territory. 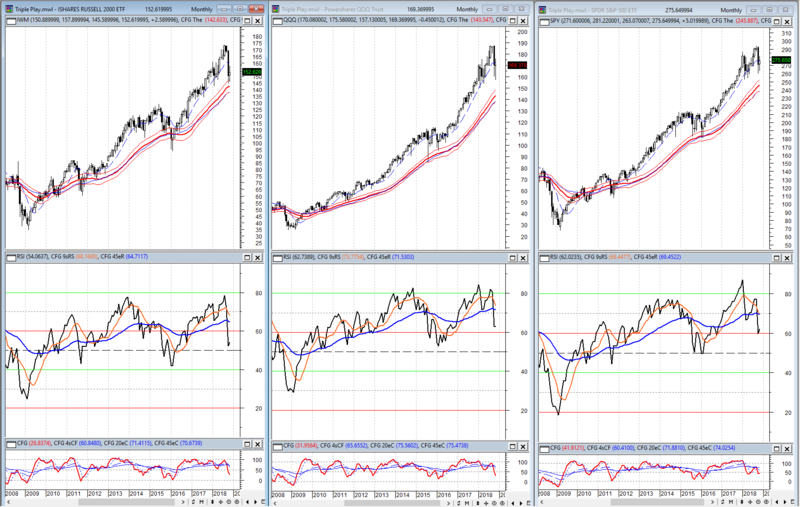 The Monthly ETF charts are all in RSI bull ranges and have been since late 2009 for $IWM $QQQ and late 2010 for $SPY. We have seen a few deeper pullbacks along the way (especially in $IWM) but all in all the longer term RSI bull ranges have held very well and CFG getting to or near Oversold levels has serves as decent entries. All of the RSIs have been trending higher since early 2016 and are just now moving back over 60 giving lots of room to move higher if they want it. We even saw the $QQQ & $SPY hit the Nitrous Button closing the year with $IWM not far behind and trying to play catch up. Divergences are potential here and would be a warning, but I believe it is too early to start that talk until they form a little better. The biggest warning I see here is the waning CFG here before getting over the 100 level showing a loss of ST momentum into the end of the year, but the elections might have been a culprit there. The Monthly RSI bull ranges are fully intact after being tested in early 2016 and now heading back higher over 60. 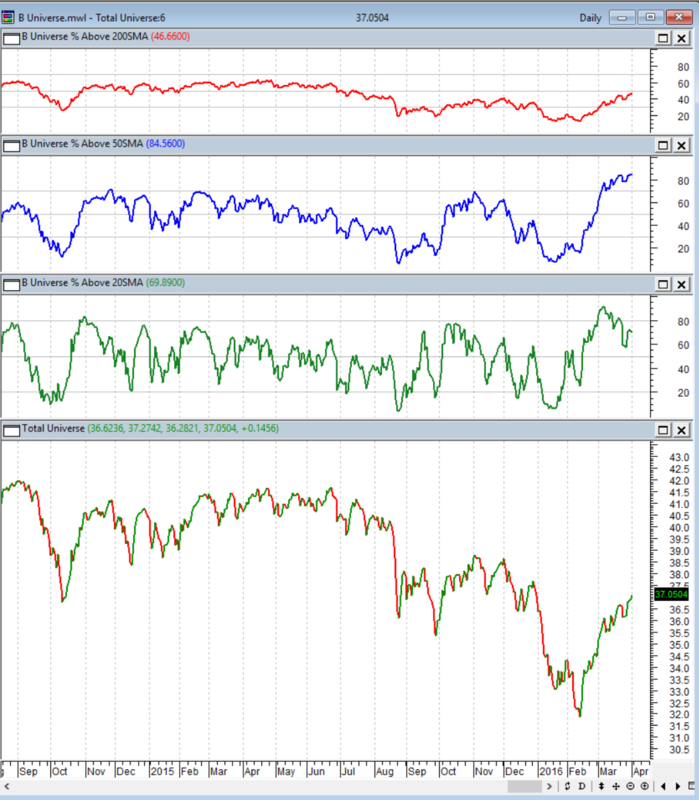 Many will see this a sign of getting overbought, but a strong RSI can run for longer than most believe. The set up here remains one of strength with potential to continue higher. The Weekly level is where things start to get a little more wiggly as larger black candles have began to show up. $IWM & $SPY look fairly extend and could easily pull back some or flag a while longer without much if any damage to the higher time frames. 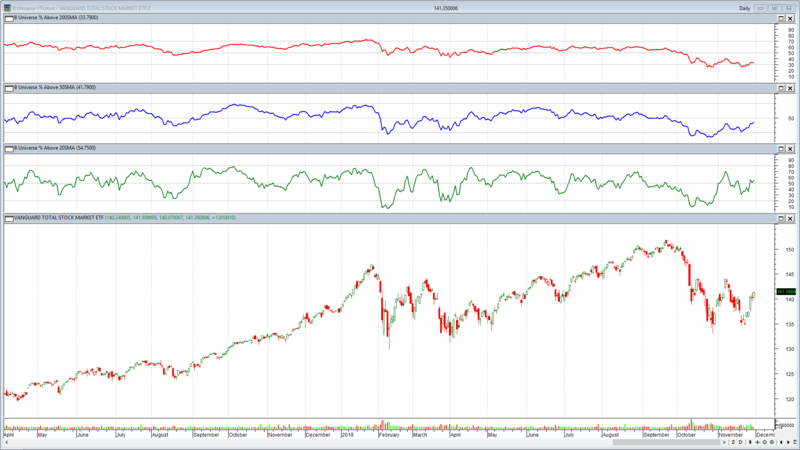 The RSI aren’t particularly Overbought, but are rolling over a little here. 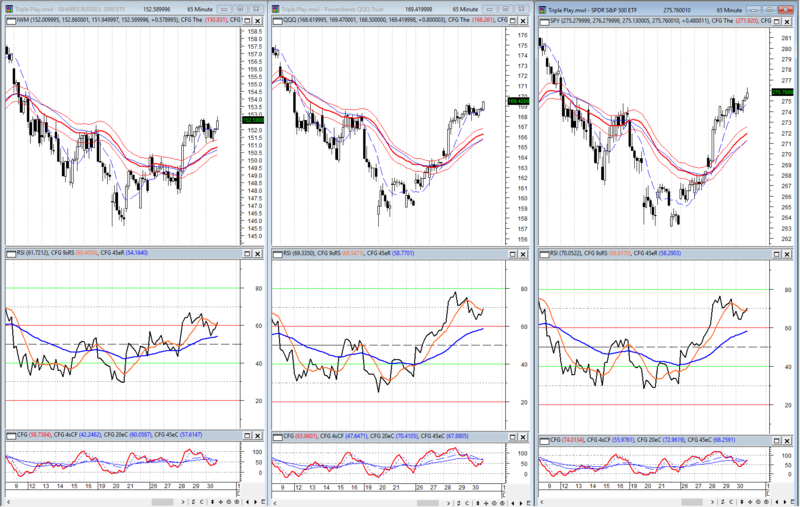 Interestingly the $IWM & SPY are also hitting the Nitrous here which always catches my eye. I want to see if these pullback remain muted and just flag from here. $QQQ is in a little different spot just breaking out and now backtesting those previous highs with RSI finding some resistance at 60. A successful backtest here could set the tone for all the major indexes in on this level. 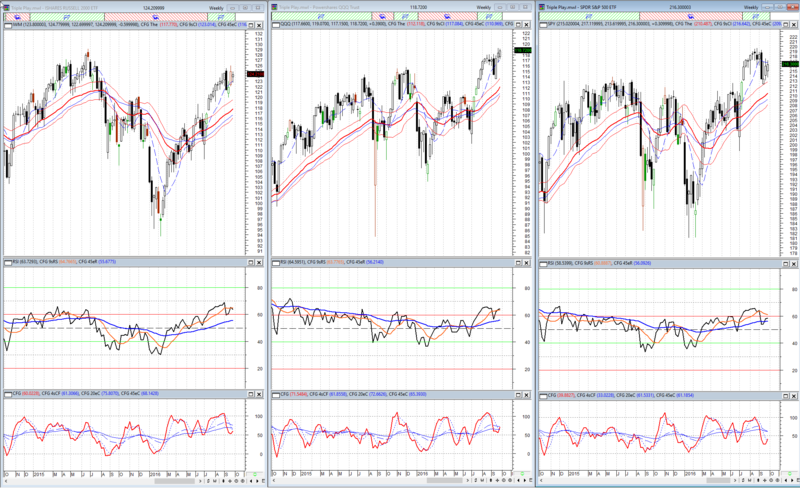 Weekly charts are starting to show signs of a reversal or consolidation, but too early to tell how it will materialize. I would cue on $QQQ & $IWM to dictate market direction in the early part of the year. The Daily view shows after consolidation most of December after the early surge with $QQQ struggling to hold the recent range break. 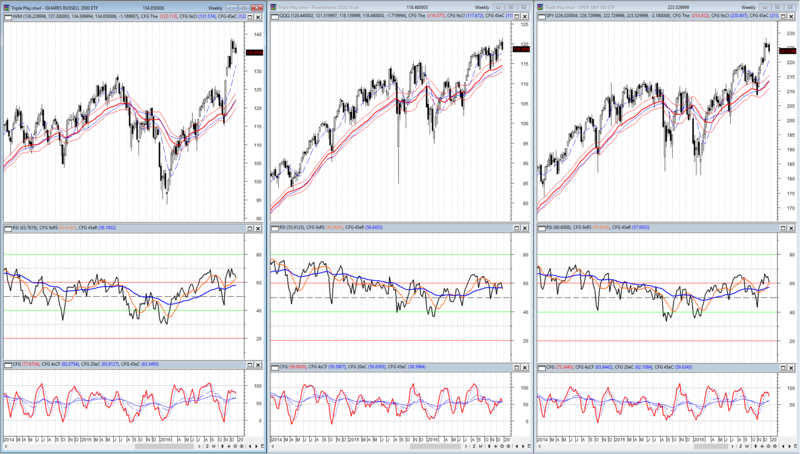 All three are still in RSI bull ranges. $QQQ looks the weakest, but if it can reverse with RSI remaining above 40 and without turning down the MA bands it will be a good sign. $IWM $SPY still have a good ways to go to test RSI 40, but they don’t have to get all the way there, a reversal at 50 is fine and might be all we see with almost 3 weeks of sideways to down action behind us here. 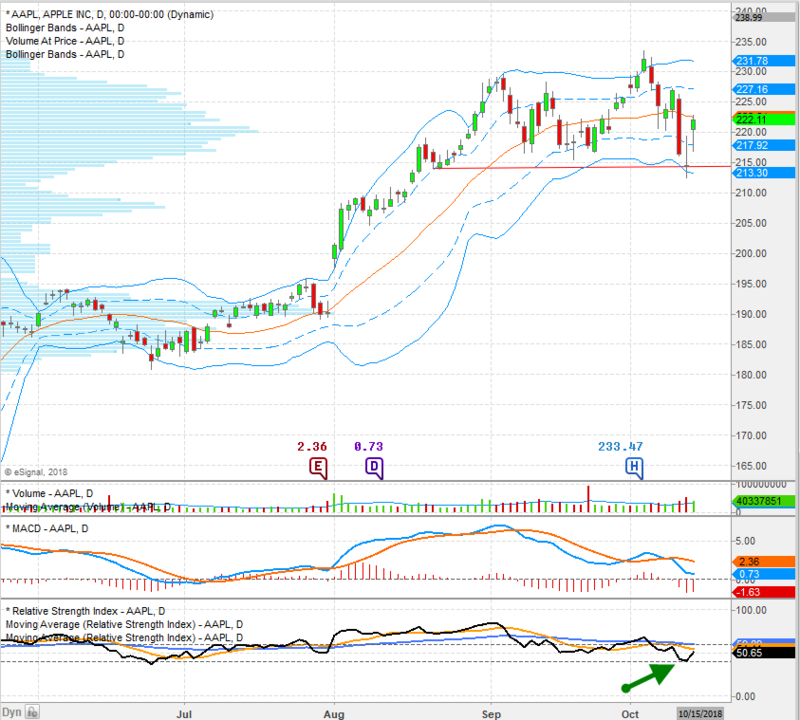 One thing I do like seeing is the faster CFG getting close to Oversold levels without seen a lot of damage to the RSI. if the CFG can reverse form Oversold before the RSI break their bull ranges (40) then it can often lead to a nice move higher to continue the trend. A reversal of trend can strike at any time, but all with all the higher time frames still in RSI bull ranges, we are watching to see if the daily charts can hold their respective RSI bull ranges on this consolidation. If so, the trend can continue higher sooner than later, but if they fail we can move a little more cautious and wait for them to set back up and align themselves again. The 1st tell her is likely the $QQQ since it is already pressing down on some important levels to start the year. The 65 minute view gives us a good breakdown of intraday price action which is currently losing momentum and ground as all these charts are in RSI bear ranges to start the year and need a move back over RSI 60 and the MA bands to improve the picture. Until that happens the burden of proof is on the buyers to show up and take charge of things. The $IWM looked the best into the close with multiple divergences showing and the best RSI & CFG levels, but that is not saying much. $SPY & $QQQ both look extended to the downside short term, but it will take some heavy lifting to shift these back to RSI bull ranges. That said, being an intraday chart, that lifting can be done within a day if aggressive enough, but is more likely to take a few days to week to play out and see if a shift back to the upside can happen before we pull the Daily charts into larger downtrends. With Friday’s close of the quarter, let’s take a quick look down this weekend. In Technical Analysis we talk a lot about looking at one or more time frames higher than the one you trade to get the bigger picture; similarly, this top down process looks at all the time frames to help us adjust our near term outlook and holding periods based on which levels are working better in the current market environment. If you are not familiar with my TP charts you can start with a these two posts here and here to learn more. 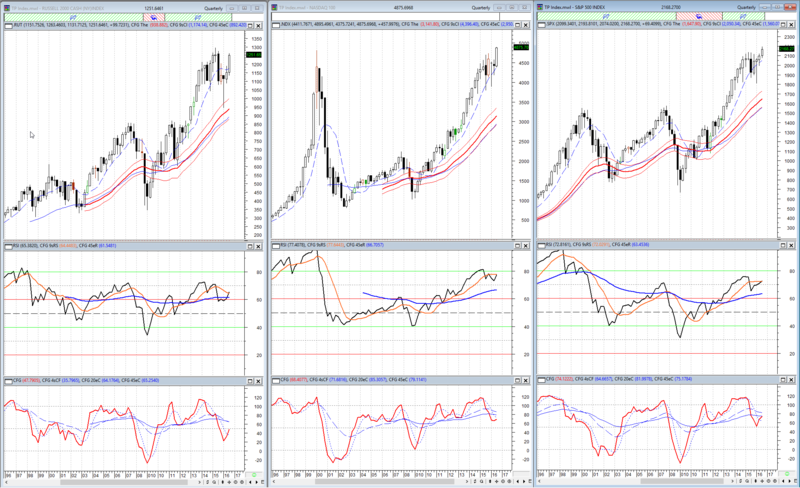 Dropping down to the monthly view, we still see all in RSI bull ranges moving back over 60 recently and not overbought. $SPY $QQQ have already moved to new highs and backtested those in the case of $SPY. $IWM is not quite there yet, but has been the strongest move off the February lows. If October can buck the seasonality and see $IWM break to new highs it would be a pretty big deal and could fuel these RSIs to overbought before done, but again intra-month volatility can still be high enough to frustrate many out of good opportunities. ON the weekly level, once again we see all three on Nitrous in RSI bull ranges, but not really near overbought territory on any of them yet. This level shows the recent breakouts and backtests on $QQQ and $SPY which proved to be successful so far. 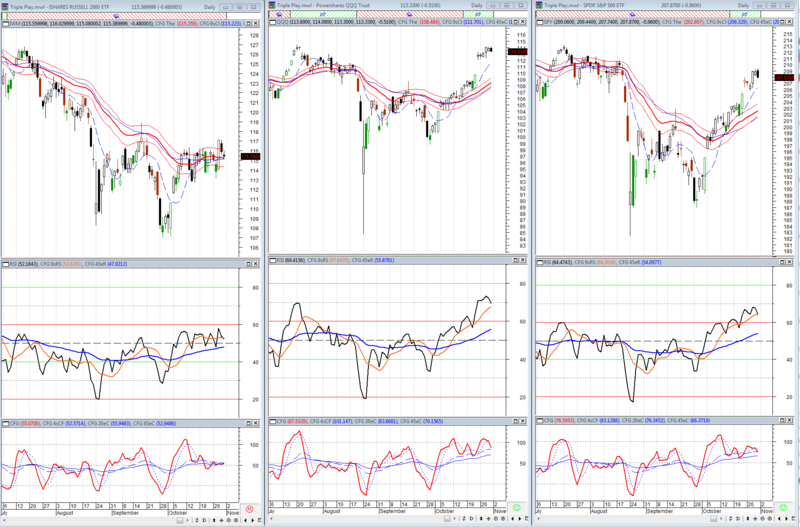 The CFG’s all just recently turned back up with $IWM and $QQQ not even breaking 50 on the pullback. It is the $SPY charts that is beginning to lag from this level. The daily view is where we can really start to see the chop over the last couple of weeks that has created the volatility in both directions, without either side gaining any traction. Here to we see the $IWM is the only one that never lost the RSI bull range in September. 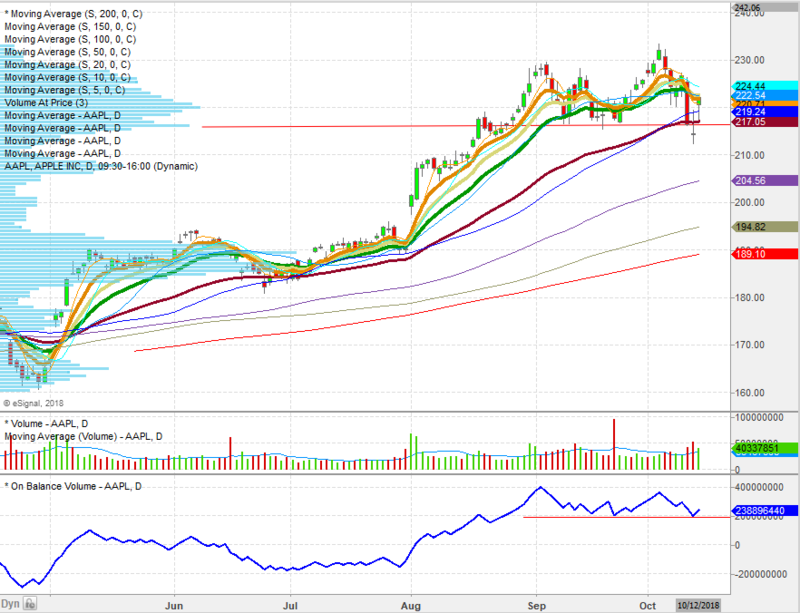 $QQQ broke RSI 40 barely, but snapped right back in what we call a range spike. This is when officially the bull or bear range in RSI is broken, but quickly moves back over RSI 60 to confirm the bull range is still intact. In the Weekly time frame I mentioned the spy $SPY was lagging which comes into clearer focus as we move down to the daily level. The $SPY is the one of the three that actually looks like it could be shifting into a RSI bear range, but with it being the only one there yet, we want at least one of the others to join it before it gets more concerning. Overall the grind off the September lows has been good to see from a strength standpoint. The 65min Charts actually shifted back into RSI bull ranges in mid September and are currently still holding them even among the chop we have seen. Friday’s closing candle does look ugly here and will be watched, but until we lose the MA bands and the RSI bull ranges break here the this level continues to support that move off the lows this month. Don’t read too much into that last candle as quarter end could have a bit of squaring going one. Monday will be here soon enough and our next set of candles will bring the next clues for us to work from. After going through this drill down, the one thing that stands out to me the most is almost every chart on every time frame is currently in a RSI bull ranges and moving higher. Contrast this AAII bulls nearing the lows this suggests to me the wall or worry is still out there even with the progress the markets and their charts have made this year since forging those February lows. Now you know my views, feel free to incorporate that into yours any way you like and as always, I hope it helps! 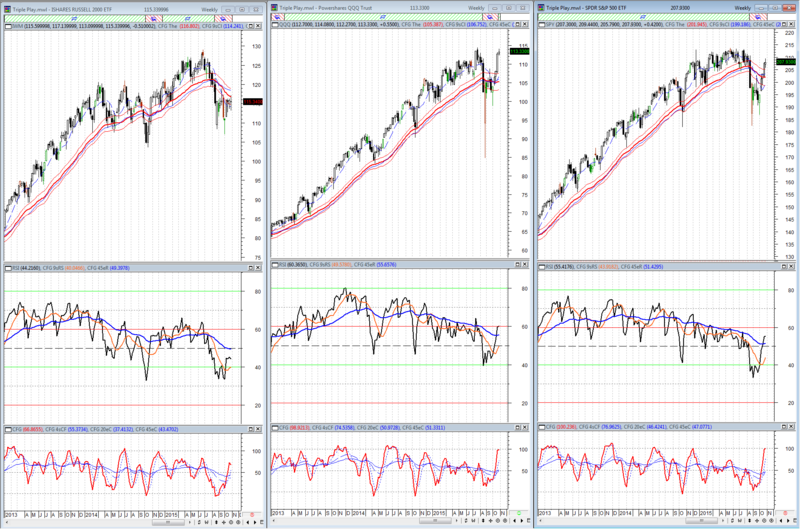 I always love it when the month ends on a weekend (even better when it’s a quarter end), because it allows us to take a very clean top down view of the major indexes using the TP charts I post everyday. The markets have been showing signs of strength we haven’t seen in awhile, but that hasn’t deterred nor diminished those looking for another big bear right around the corner. And, the could be right, but I prefer to let my charts guide me to such a decision. This top down view allows us to move from the 50,ooo foot view quickly down to an intraday chart. 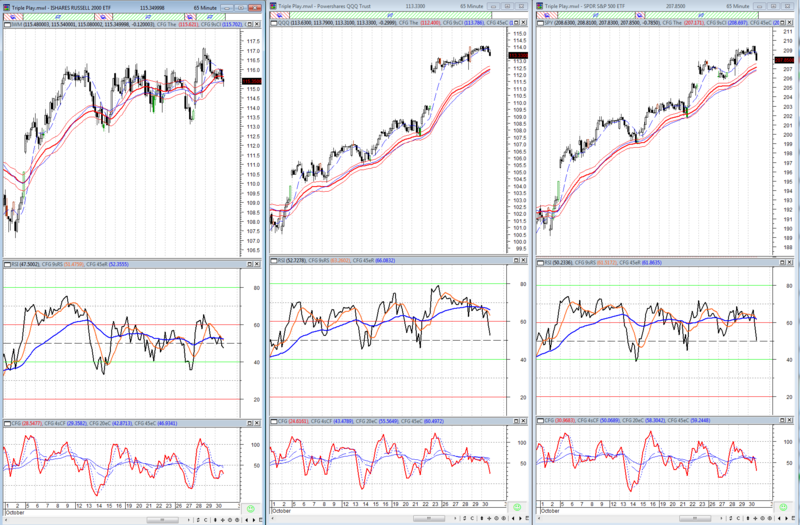 For all traders or investors at least one or two of these views can be helpful even if you don’t trade the indexes. Let’s dig in. (disregard the arrows charts, they are not meant as highlights). Not much to argue with here as we start with the monthly view. $SPY has already left the station, $QQQ challenging now and $IWM still has a ways to go, but is giving a good effort since bottoming in February. This shows only $IWM was officially in a bear market by percentage decline, but I would say two years of this action worked off excesses in many stocks throughout the markets and could be qualified as a stealth bear market if it must be labeled (labels don’t usually help much). RSI did work off the overbought nature during this time period, but never threatened breaking down into a bear range even in the $IWM during this decline. 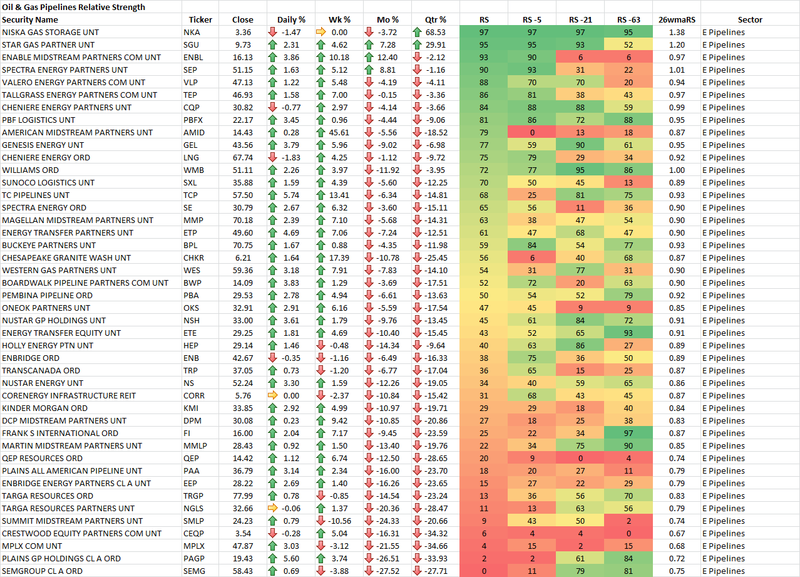 In fact, $SPY $QQQ RSI never even lost 50. On the Weekly time frame you get a better feel for just how much the $IWM underperformed over the last year, but it has also been the most aggressive off the lows in an attempt to play some catch up. 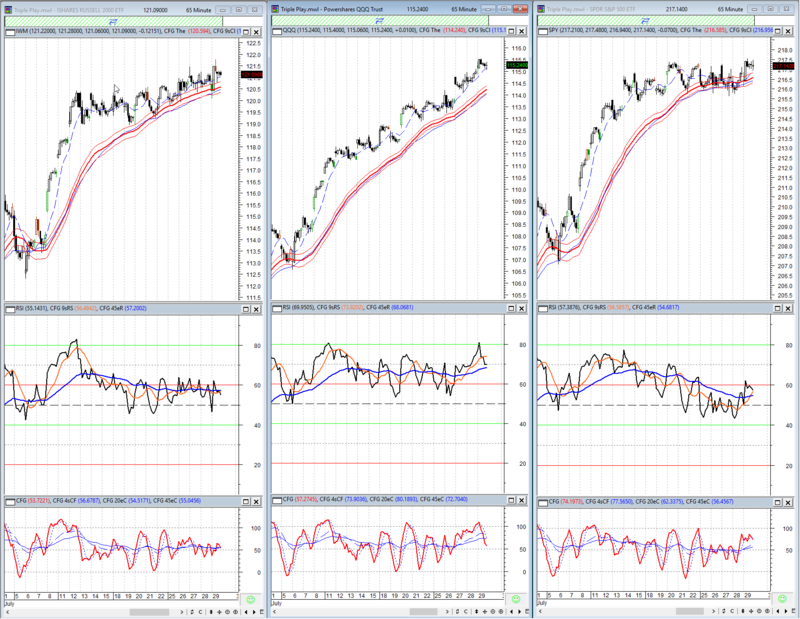 RSI here did move into bear ranges last year and recently moved back into RSI bul ranges across the board. $IWM & $SPY are even close to hitting the Nitrous. The daily charts are all sitting in RSI bull ranges, above the MA bands, on Nitrous and none are overbought at the moment. This momentum won’t last forever, so enjoy it while it’s here and stay attentive for signs it is waning. Even drilling all the way down to the intraday view of the 65min charts you can see the recent sideways action in $SPY & $IWM are hardly bearish so far and helped work off the oscillator so another surge could certainly happen if we break out of these creeping ranges. 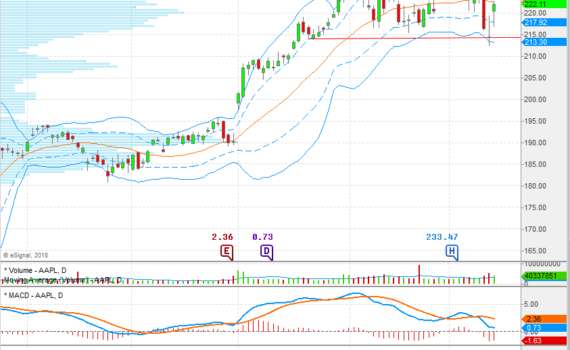 $QQQ is doing its best to lead the way. That is my view of where we are right here right now. It can change within just a few candles if the action changes, so there is no need for me to rush to judgement or attempt to anticipate when the buyers will take a break. Like I said above, enjoy it while it lasts and let your risk management plan take care of the rest. I haven’t done videos in a while, but really like them when I do (not a big fan of typing). I think they can make it easier for me and by followers if I can go more this way, so Let’s start off with a few thoughts in IWM. 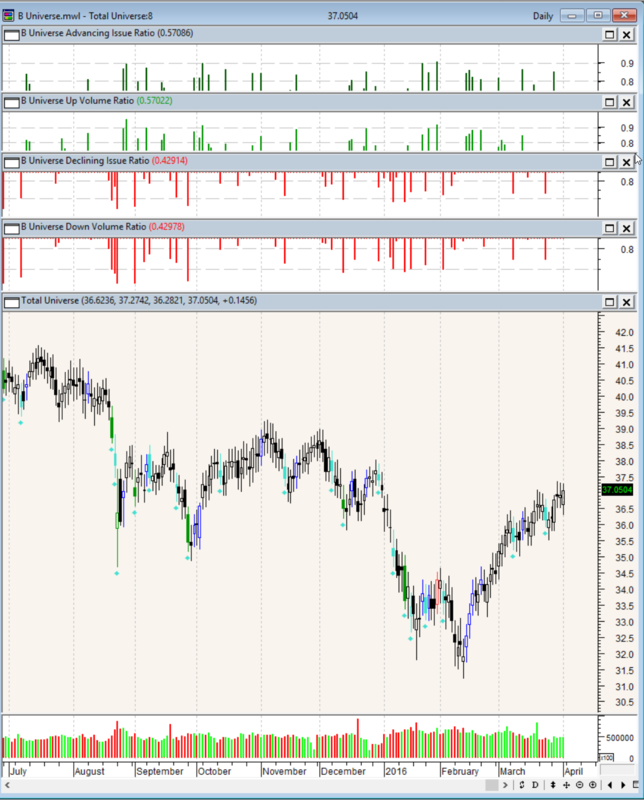 I take a look over 3 timeframes with two different technical tools on each level. As always I hope this helps! There is no guarantee that the views expressed in this communication will become reality, Investing in the stock market involves risk and potential loss of principal, Investment strategies should be thoroughly researched and understood before implementing and none of this should be construed as a recommendation. Right now there is a lot of noise about this being a dead cat bounce that is about to top. It certainly may be, but to be fair, the same people have been saying that since a couple weeks off the lows and a ton of $SPY points lower. One thing I like to look at is how the breadth picture is progressing off the lows so let’s take a quick check and see how the broad internals are holding up. 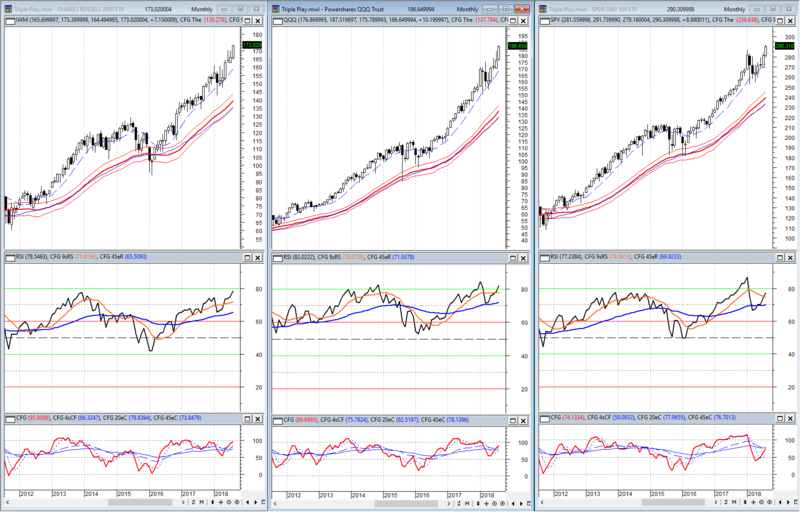 With this indicator you have 3 triggers, the actual NHNL Differential (black bars), the 10sma of the NHNL (red line) and the 30sma of NHNL (blue line). 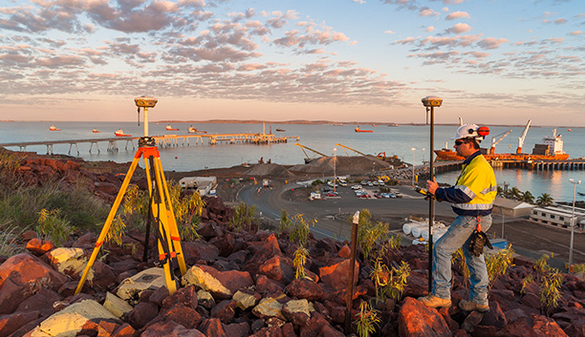 each signal heightens the risk and when they are all triggered it is usually time to get out of the way. We saw all of that starting last August, but the big divergence in late September saw a dead cat bounce, but failed to get the traction needed. 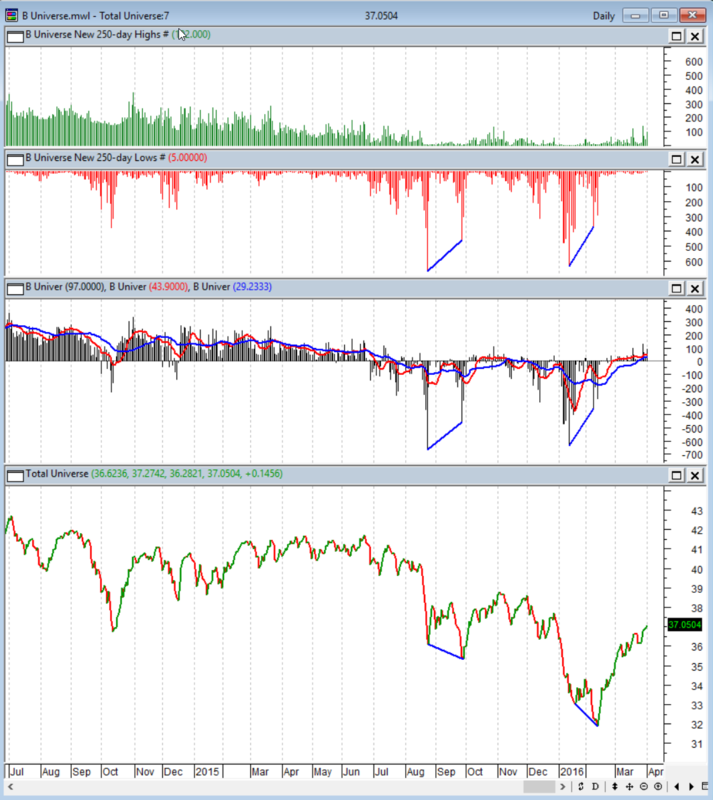 However, we got another new lows with divergence in early February. One failure is fairly rare, but two would be very unusual. Well, since then we have seen a strong move of the lows and just last week we have reset all 3 triggers putting this back on the buy side. Next long term reading is the Advance Decline Line which I have posted a few times during this rally showing it have been leading price during much of this rally. The Advance Decline Line is not leading as well at this point, but still moving higher with price at the least. 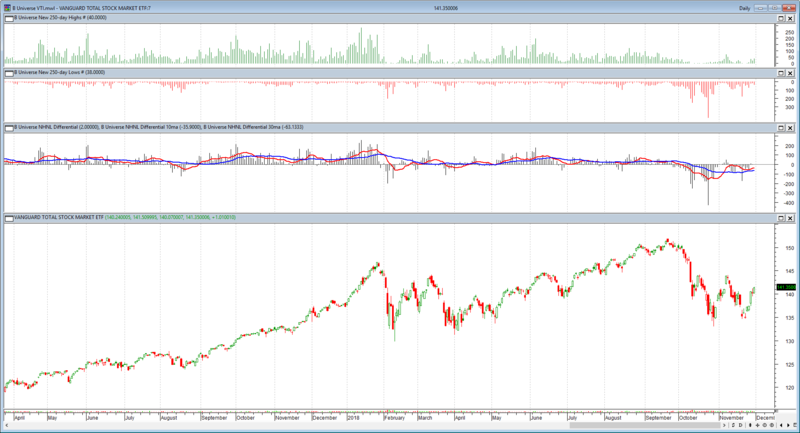 The final long term reading I watch is the %>200sma (top window) in the next chart which is also moving well off the lows and has almost retaken the 50% line. 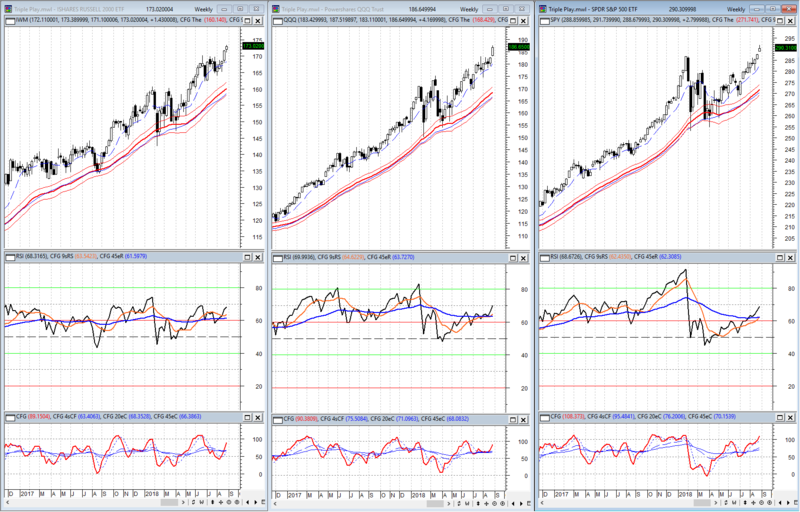 From an intermediate perspective the %>50sma crossed 80% in February and remained strong all March. This level of movement in the long term and raw strength in the intermediate reading doesn’t hint at the dead cat resolution. 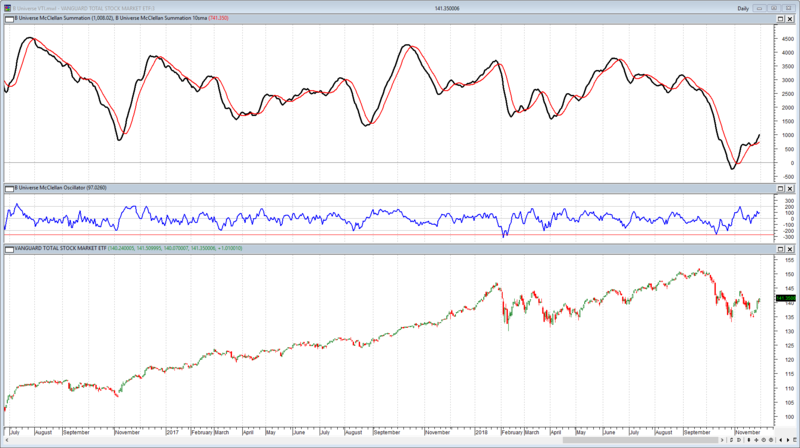 Our next intermediate reading and probably my favorite breadth indicator is the McClellan Summation Index which also showed a divergence right at the lows and hasn’t looked back. Not even a flinch. That type of move takes a very strong and broad move to create. 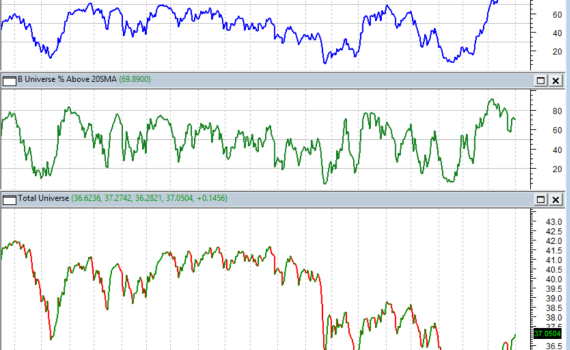 The shorter term Oscillator has also remained solid with only one dip below zero since the lows were put in. 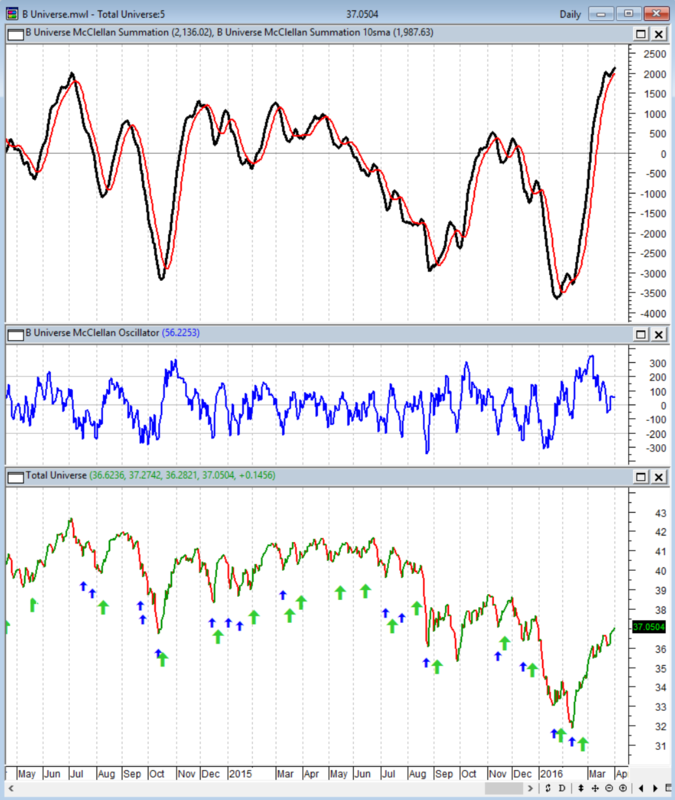 The Breadth Thrust indicator is similar to the Oscillator, but bound from 0-1 to help with cross comparisons. It also shows the breadth has held up well on the way up, but is working on multiple divergences which often precedes a pullback even if just short term. One final chart we look at this the Percent Days chart which calmed down a lot since the lows. In fact most of the readings have been to the upside. That level of calmness usually accompanies uptrends more often than it does during downtrends where the volatility is noticeably higher giving more readings here. So reading through each of these charts we can see the progression off the lows has been more than just good, it has been excellent. That doesn’t mean we make new highs right away, but it does raise the odd that the February low was a significant one. As we enter the resistance zones in the major indexes we are likely to see pullbacks and consolidations, but as long as we continue to see breadth signals progress are chances of grinding back to the highs remain good. The weekly level shows just how bad the $IWM has been lagging as it can’t get over the MA Bands and remains in an RSI bear range. 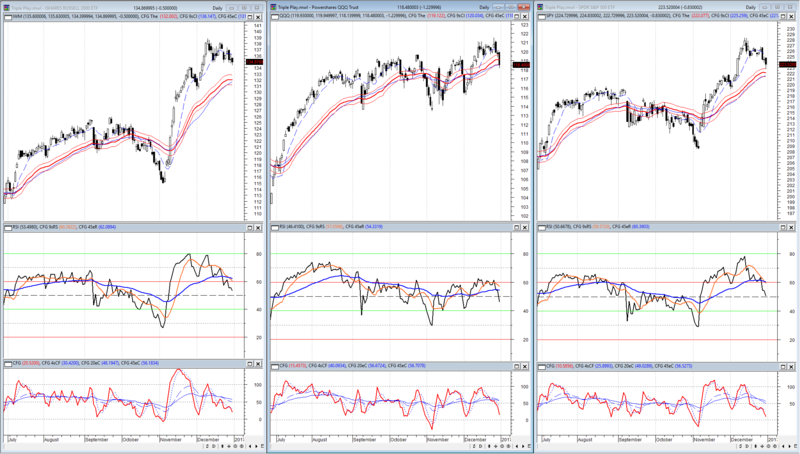 The SPY has moved back into the summer range, but hasn’t quite gotten the RSI back above 60 to resume its bull range. Interestingly, $QQQ actually had the most dramatic drop, but never actually shifted to an RSI bear range and closed back over 60 this week. 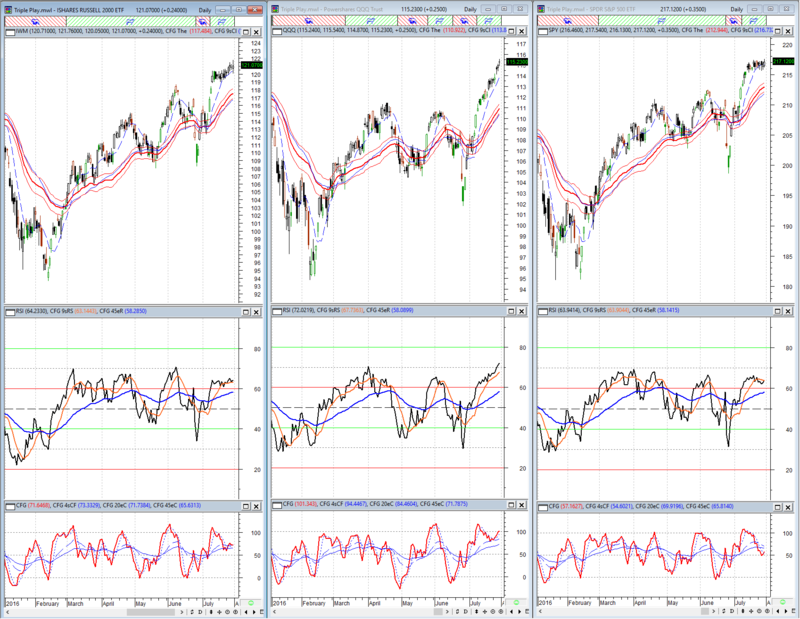 $SPY $IWM still work to do before moving back to bull ranges while $QQQ never left. 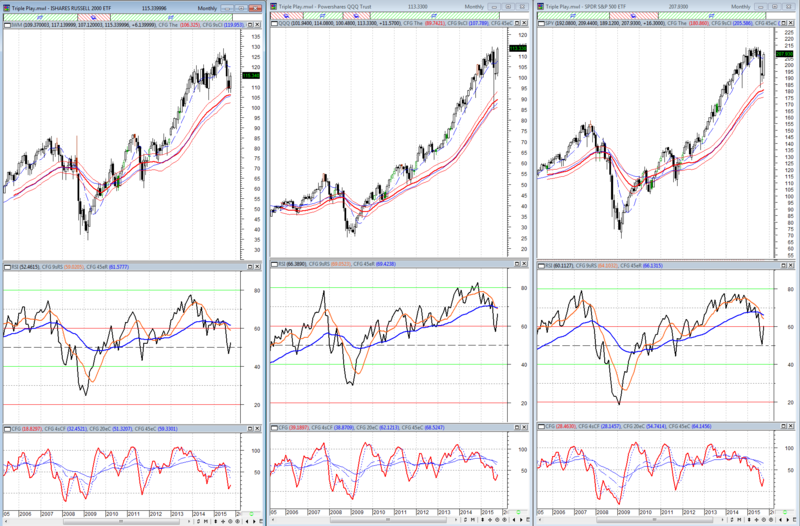 On the Daily view it is clear $QQQ has led by the chart as well as its RSI has moved up the fasted. Both $SPY and $QQQ also hit the Nitrous last week. $IWM has not been able to break over 116 for weeks. It got there on Wednesday, but couldn’t hold it yet. this is not the end of the world with the other two performing so well, but the non-confirmation is one concern. The $IWM not shifting to a RSI bull range is the big drag still on the daily level. This chart shows October broken down into 65 minute candles. This level still shows all three in RSI bull ranges giving a positive skew, but the $IWM continues to oscillate through bull and bear ranges as prices consolidates sideways. So far neither side can take the baton and run with it in small caps. $SPY $QQQ are both in solid RSI bull ranges currently testing 50 after the late week. Fridays close did not look great and could lead to a test of the ranges as well as the MA Bands or we could get a reversal from here which would create some RSI Positive Reversals to consider. Remember, this is the shortest time frame in this study, so it should also take the least precedence, but come Monday morning it will be where the process begins once again to build the next installment. Yesterday’s original post, Drilling Deep into the Oil Patch built the case for a potential bottom in energy even if short-term. I also pointed out that when things get this stretched to one side and short-term divergences start showing up then the snap back move can be fast and furious. After a slow morning, the Energy space turned in a pretty solid day in a volatile environment. 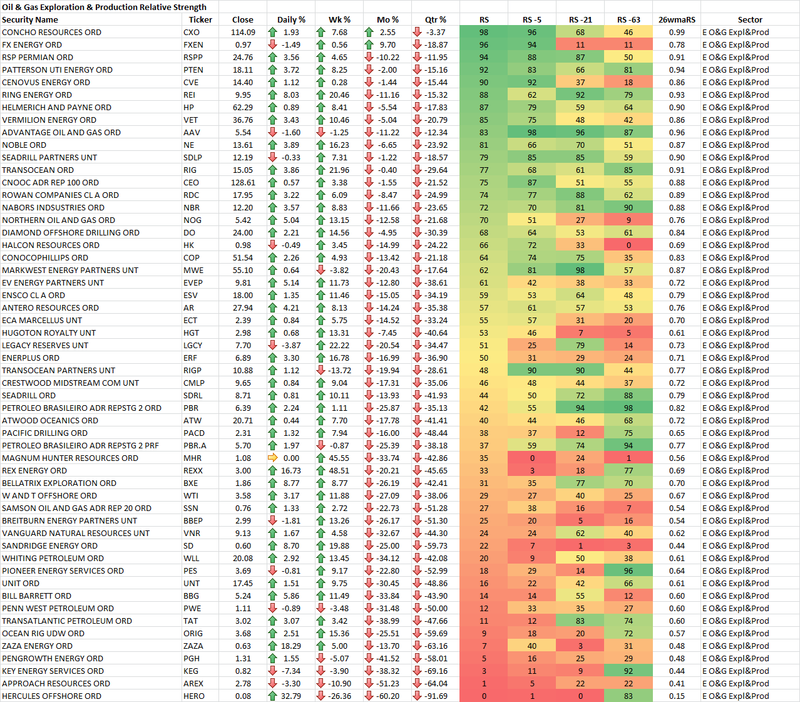 Today I wanted to follow-up and give you the raw relative strength lists for the subsectors so you can do some of your own digging around. This data is as of last night, so it does take into account Monday’s action. It is also worth noting there is no filter on these groups so you will see some sub $3 securities of which many are making big moves. Just realize those big moves come with an extra helping of risk, so be careful. 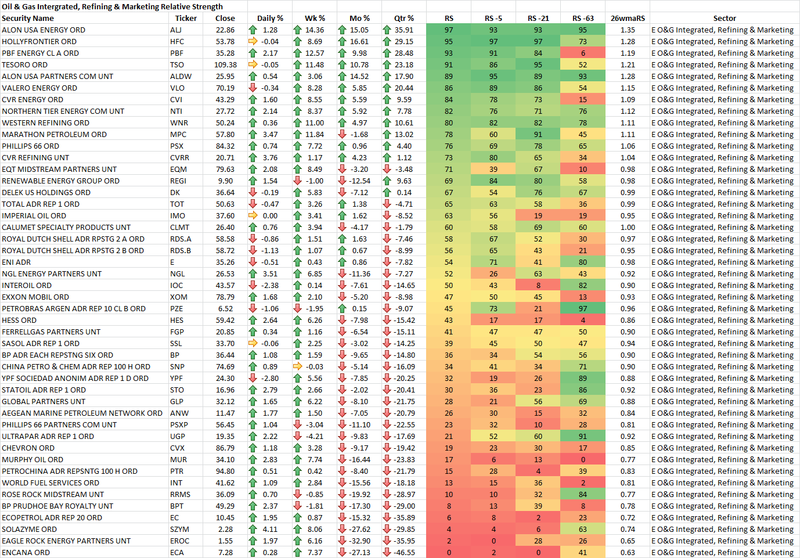 If you want a quick view of the charts, just click on the FINVIZ links below each table and you are there. 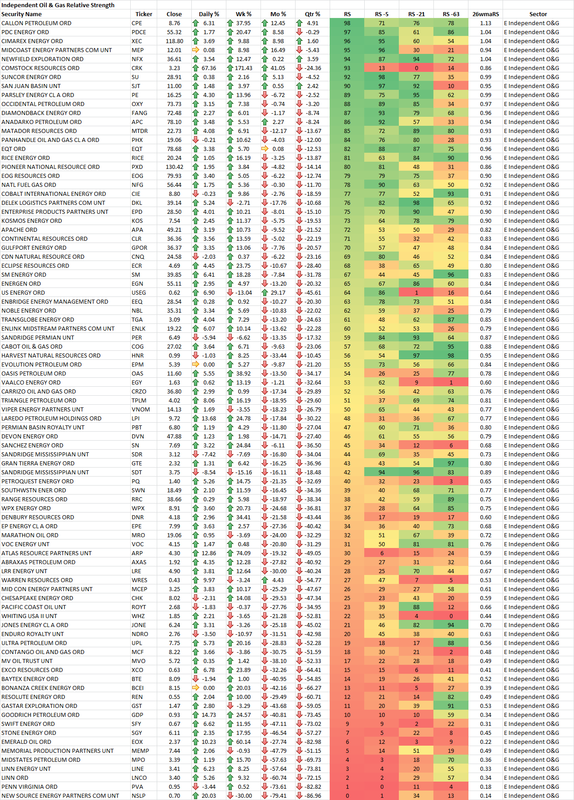 Above has all the subsectors, I know it can get a little hard to read the longer lists, but am still trying to find a gallery that allows for more zooming. Until then, get the basics from the tables and use the FINVIZ from there. Don’t forget to look back at the original post to see the movers and check on how they performed with the included links.